Offer insights from content marketing analytics. According to Entrepreneur, data is the cornerstone of marketing. Users have access to an analytics dashboard that provides an overview of all of their activity across content type and distribution channel. 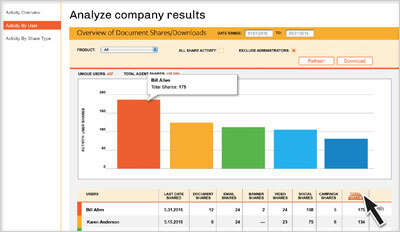 Users can easily drill-down for more detailed reports. Administrators have access to content marketing analytics that show you which collateral is being used, by whom and how often. These insights can inform utilization, retention and content-development strategies moving forward. Activity dashboard — Provides a snapshot of all activity across channels. Sortable by date rage, product type and topic, gives high-level activity insights across the type of content shared. Overview reports — Gives users a sortable list of content by type that they shared during a specified date range. Detail reports — Offers usage insights for individual pieces of content. Not only does the report provide utilization metrics, the user can easily see a preview of the actual peice shared and have the option to share it again, right from this screen. Share it again — If users see a piece of content they haven’t used in a while or that has been promoted on one channel but not another, they can share it again without leaving this screen. Company-level activity overview dashboard — Get high-level summary data on utilization by type, users, active users, contacts, number of items in the library and more. Plus, you have the flexibility to sort by date range, product and topic or tailor your dashboard to fit your needs. Activity by user or group — Lets you quickly identify power users or “under-utilizers” during a specific time/date range. 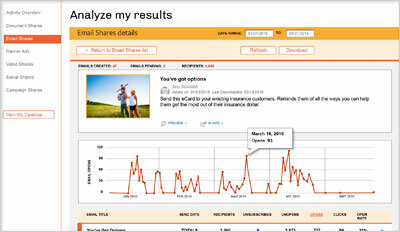 You even have the ability to “drill-down” for more detailed utilization data on each user by selecting their account. Activity by share type — Allows you to quickly determine your most popular content and even drill-down to see who shared it during a certain time/date range. Plus, you have the flexibility to sort by date, product and topic or tailor the report to fit your needs.